This one I’m going to do in more than one part. You’ve got admit that was, for this blog site anyway, sensible. In the Houses of Parliament, you will find the repository of all wisdom, sincerity, truth seeking, beneficence and self-effacing personal sacrifice. Well, you can’t be sensible all the time, eh? 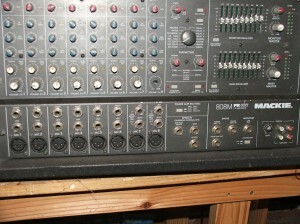 The Mackie 808M is quite a lethal package for a small box. At 600 watts rms per side, that’s a lot of watts; and it’s not fan cooled. But it has a nice chunky, cast alloy heatsink on the back, that you could probably chuck a few burgers at and double as a Barbie when used in anger. There’s one born every minute. The reason for this serialised blog, is twofold. First, if I keep going too long, it’s only goldfish that will be with me at the end. Mostly because they think it’s still the beginning. Secondly, it broaches the subject of switched rail supplies, and that could do with a piece of its own. Any conventional class AB amplifier (which is most of them) rated at over, say 300 watts rms, is almost certainly going to have switched rail supplies, and that means that, it has an extra pair of voltage rails (often at twice the voltage) in addition to the usual + and – rails. 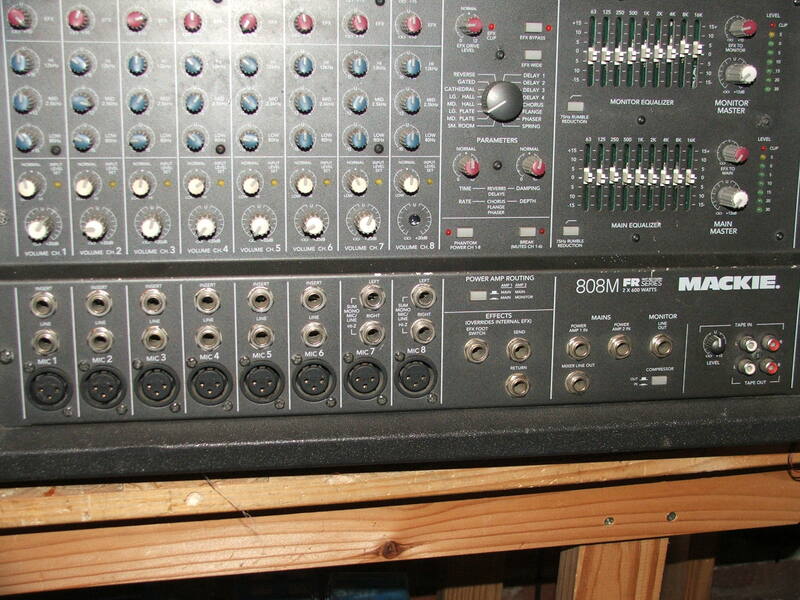 This is the front of the Mackie 808M…..(Duh!). Unless you’ve had a serious bad time with whoever sold to you, there will be something behind it. The ‘something behind it’ looks like this. Unless you’re a victim of one of those dubious types that infest ebay, in which case it will look like this…..
Let’s assume for a minute that the inside of yours isn’t a house brick. Referring to the pic above that, there are two components marked ‘High rail switching mosfet’ and ‘low rail switching mosfet’. 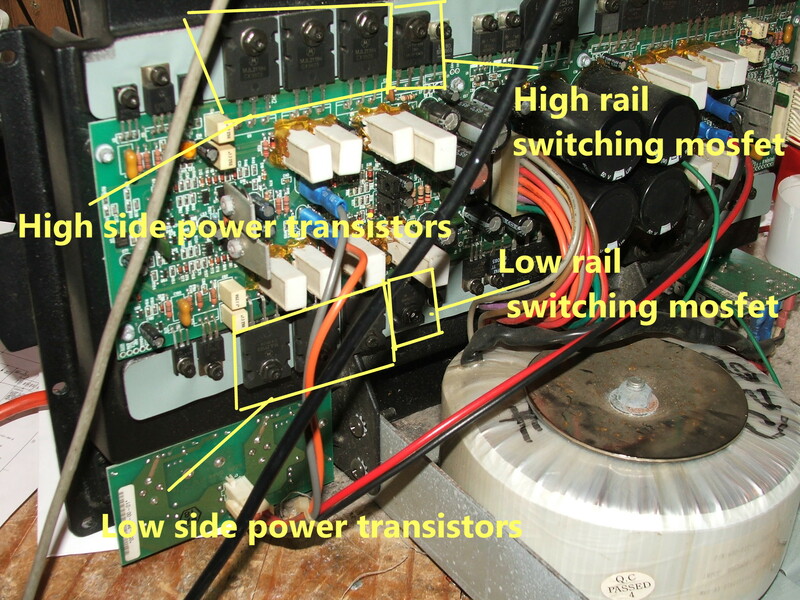 The basic idea behind rail switching is that the mosfets (in this case an IRFP150N and IRFP9140N) switch the higher rail voltages onto the power transistors MJL21194. So what? So that the higher rail voltages give a much higher peak to peak output level before clipping. So a big increase in power output capability. The fault in this amp was that the output distorted, it also had a dc offset; not a lot ( about a volt or so) but enough to know that all was not well in Offset Voltage Land. It turned out that the low side mosfet switcher had shorted. So the voltage to the high side was about +45 volts and the low side rail was -90volts. Quite enough to upset the output dc offset and produce a lot of a-symmetrical distortion. This fault was cured by replacing a fiver’s worth of mosfet. Un….fortunately, there were other problems, but at least I wasn’t tempted to take the output stage to bits. I’ll do a bit more in detail about rail switching in another blog soon; but I have to take my goldfish for walk. And here’s a little aside, just while you put your bedsocks on. I had a repair shop for few years in a little town on the North Wales coast. I had to close it after a visit from somebody called ‘Bailiff’ and somebody else called ‘Taxman’. They both wanted the same thing. Called ‘Money’. I digress. Just across the road from my estimable establishment was an emporium called ‘Aladdin’s Cave’ run by Tony. He came across on this particular day. He’d just bought in a TV set (for sixty quid if I remember right), which he had, unwisely, not tested before parting with his money. We sat in front of this machine on his counter, twiddling every knob and switch we could see, and nothing happened. I took the top off and inside, completely alone and taped to the bottom with gaffa tape, was a house brick. 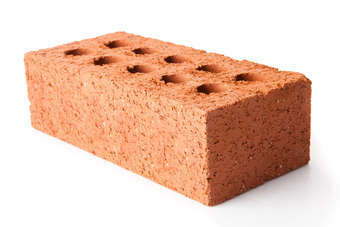 That was an expensive brick. And now to put the kettle on. I noticed that these blogs could be loosely categorised. There are those that are specific and useful to a very small minority. One, actually, and that’s me. There are those that are nonspecific and useless. They appeal to nobody at all…well, alright I like them. There are those that are, really, quite loony. As most folks seem to be serious, these don’t have any general level of appeal except for people who wear tartan jackets, very long shoes and a red nose. Suffice it to say that’s what I turn up to work in. This is a high elevation, high definition, uni-chromic, digitally encumbered, perspective enhanced, indigenously florid…. well, it’s actually a picture of a 1200D amp with the lid off. But the marketing department got there first. 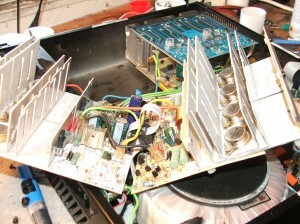 The blue pcb’s at the top are the power amp modules. As the whole of this amp was designed and largely hand-built in the UK, so were these. The module consists of two pcb’s and their heat sinks which screw together with insulating plates. The top one is the rail switching pcb and the bottom one, the power amp. You can see one of the power transistors MJ15022/ MJ15023 with its T03 case screwed to the heat sink. This is a shot of the two halves of the pcb separated. 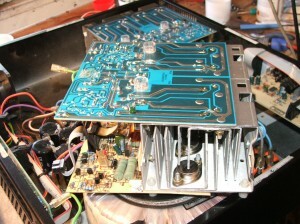 All the connections are by spade terminals and there are three interconnecting cables that link the top to the bottom pcb. All the cables connecting the power supply pcb to the module are colour coded and also marked as to their function and voltage. This is design and manufacturing with repair and servicing at the forefront. The schematics were (and still are) easily sourced and most of the components are still readily available. 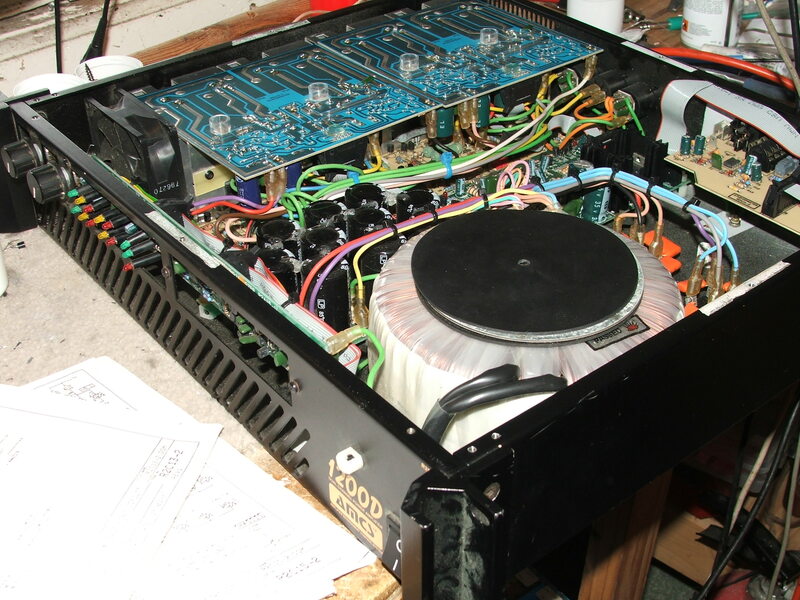 We could really build an amp, when we wanted to. There are many of these twenty-ish year old amps still doing the business, and if they do fault, you would expect to be able to repair them. But this is not a do-it -yourself Studiomaster fixit blog. Sorry about that. Most faults that do occur in these, involve rebuilding the power or switching sections and, if it’s really not your day, both of them. But the modules are separate, so work on channel A won’t affect channel B, so that’s a plus. It is nice to think that something designed and built within a hundred miles of here twenty years ago can still kick the arse of last week’s offering on all counts, and not break into a sweat. I’m going to celebrate that with a nice cup of tea… and even…a macaroon!!!! These things are/were a lot of money. Not in the astronomical terms of the Kuiper Belt audiophiles who have light frequency eardrums, but in normal-ish terms of something that might cost the equivalent of a newish (but still second-hand) car. This little missive is a toe in the sulphuric acid towards getting going again on the blog. I’ve noticed that the whole of the internet becomes bereft when this little blog disappears. EVERYTHING is SOooooo Serious……..AND…….IMPORTANT!!!!!!!! Unless it’s pseudo light-speed-hearted. Which is even more serious because it’s usually written by folks who think that ‘U’ is the way you spell ‘you’. God knows what happens when they get to a hard one like, say Wednesday. That must be ‘Wdndy’. But that could be short for ‘fart’. I suppose. Anyway, this Nu-Vista valve preamplifier had me rushing to my valve detecting machine cupboard (I’ll spell that cpbd) because there wasn’t a valve of any description in it. What we did have was a reservoir capacitor (1000uf @ 100volt if memory serves) that had pretended to be a Mills grenade, and there was quite a lot of it plastered around the inside. This capacitor had shorted and taken out a dropper resistor and had also spiked a voltage regulator further along. The whole job was made conveniently intractable (that’s cvnty itcbl) by the internet (or at least Musical Fidelity) being as devoid of schematics as goldfish in my sulphuric acid footbath. At least George Orwell had ‘Newspeak’ which told you nothing at all but sounded important. What we seem to have now is ‘No-speak’ which tells you nothing at all because it doesn’t exist.